This BT-117 Distressed Brown Lizard Square Toe 13" Roper Heel Broken-T-Boot designed with the unique shark toe is one of the most comfortable boots you will ever own. This boot is top of the line handmade quality cowhide. 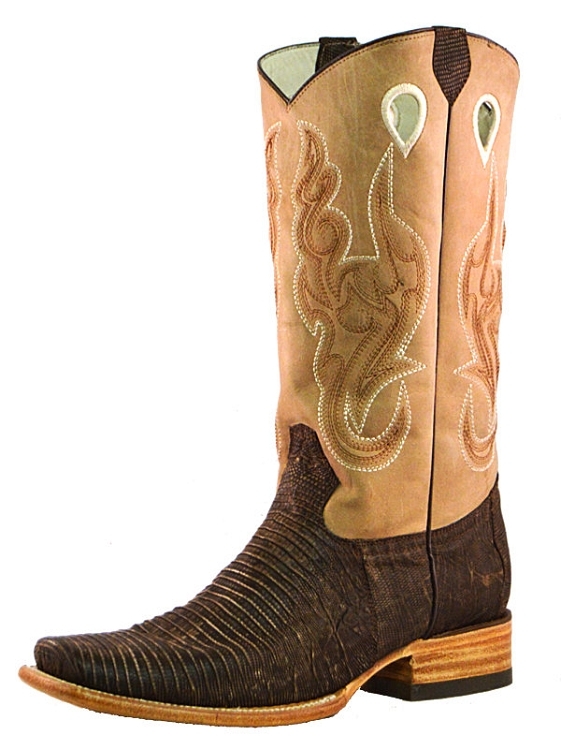 Height 13" Soft distressed brown lizard with khaki shaft cowhide top with elaborate stitching and embroidery / teardrop finger pulls / shark nose square toe with double stitched leather soles / roper heel. Fully leather lined inside with cushion insoles. This class boot can be worn for all occasions. We suggest ordering 1/2 size larger than your average shoe size. It is very important to choose size based on REGULAR shoe size, not your typical boot size from other boot companies.